This page contains a full walkthrough of Main Mission Gathering Echoes for Prey, including objectives, items and enemies encountered. 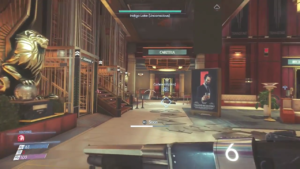 This is a Prey walkthrough. This page contains a full walkthrough of Main Mission Gathering Echoes for Prey, including objectives, items and enemies encountered. While in the area, unlock the airlock in the Arboretum. This will give you access to the Arboretum, Hardware Labs, and Psychotronics from the exterior of Talos I. However, the airlocks for the Shuttle Bay and the Power Plant is still locked. Go out of Deep Storage via the Grav Shaft then find the Looking Glass station nearby. Break the Looking Glass screen to reveal a secret room which contains a Medkit. Above the Medkit is a shaft, some Mimics will come down from this shaft taking the form of cardboard boxes. Defeat the Mimics then go up the shaft. Use the GLOO Cannon to make climbable platforms. 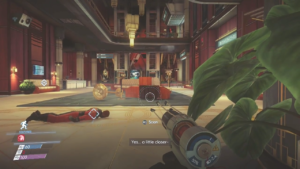 The Grav Shaft found in Alex Yu’s office is locked, so you need to have the Hacking IV ability to unlock it. However, there is another way up to his office, you can go there by pulling yourself onto the ledge while your are still atop the roof of the Looking Glass station. From there, look for a damage electrical junction, use the GLOO Cannon and fire it against the arcs, which will repair it. Search the body of Marietta Kyrkos and retrieve the keycard to Jada Mark’s cabin (Crew Quarters) and a Transcribe. Listen to the recording and continue along the path. Go inside Alex’s office and look around his desk to get a Neuromod. There is also a Weapon Upgrade kit on the table next to the wood burning stove. The workstation in the office is password-protected, so you need the Hacking IV ability to unlock it. There is a large crate located in front of the maintenance access panel. The crate leads to a hidden compartment which contains Alex’s safe. Move the crate with your Leverage II ability in order to gain access to the panel of the safe. Use the keycode that you have gained from December to open Alex’s safe. Opening the safe will give you the keycard to Alex’s suite, a Scope Chipset, a Nullwave Transmitter, and two Neuromods. After looking around Alex’s office, step outside then use the nearby staircase which leads to the roof. Return to the G.U.T.S. Loading bay. After entering the Crew Quarters, crouch immediately as several mind-controlled crew members are wandering around the area. Equip the Disruptor Stun Gun and try to incapacitate the crew members while sneaking your way towards the nearby Medical Bay. The door that leads to the Medical bay is blocked by crates. Move them using your Leverage I or II ability to gain access to the door. Inside the Medical Bay, you can find a Medkit and an Anti-Rad Pharma Fabrication License. You can also use a Medical Operator from the dispenser. Stay crouched as you return to the foyer as to not get spotted by the remaining crew members. 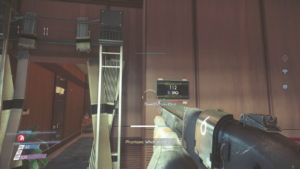 Go behind the concierge desk to gain access to a security station. From the security station, you can download a map of the Crew Quarters as well as some evidence for the Whistleblower optional objective. Read the “New Gym Code” email to gain the keycode to the Fitness Center. Go behind the concierge desk to enter the mail room. Hack the door using the Hacking II ability and enter the door. Once inside the room, search the body of Lia Macy and the shelves for supplies. You can get three Neuromods, a Weapon Upgrade Kit, and shotgun ammo from the shelves. Cross the foyer in order to enter the recreation center. Stay low while looking around the recreation center as some crew members are here. Head towards the large television in the area and a cutscene will occur. You will have to fight a Poltergeist after the cutscene. Scan the enemy with your Psychoscope when it appears, as this move will make the enemy much easier to track once it is invisible. The Silenced Pistol is the most effective weapon against the Poltergeist, so rapidly fire multiple shots at it once it reappears. After defeating the Poltergeist, go up the staircase to reach the second floor. Get Elias Black’s Transcribe at the large table to listen to a recording. The table also has Abigail Foy’s keycard to her cabin as well as character sheets belonging to Elias Black, Emma Beatty, Zachary West, and Danielle Sho. Grab the note near Black’s Transcribe to reveal the Stabfellow’s treasure map. Go out of the recreation center’s second floor mezzanine and you will see Brett Seydel’s body next to a broken turret. Repair the turret and carry it with you as you return to the foyer. Jump over the mezzanine railing then use your propulsion system in order to slow your descent. The entry to the first floor of the recreation center is blocked by crates. Cross through the foyer while holding the turret and enter the Crew Cabins B corridor. Find some voice samples before moving forward. Deploy the turret at the entry of the corridor then sneak forward to locate a patrolling Phantom. Let the turret kill the Phantom, then search its remain to retrieve the belongings of Ivy Song. If you got Jorgen Thorstein’s keycard at the Hardware Labs, you can gain access to his cabin (first door to the left). You can a Recycler Charge Fabrication license, a Scope Chipset, and some exotic material inside his cabin. Go inside the cabin to get some supplies. Search the body sitting in the chair to get Suit Repair Kits, a Psy Hypo, and a Medkit. Also, get the Anti-Rad Pharma Fabrication license on the bed. 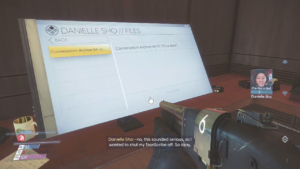 Read the note attack to the keycard reader once you are in Danielle Sho’s Cabin. Get the Neuromod on Danielle’s desk then access her workstation. In the File tab, download the conversation archive to gain access to a recording. Read the emails on the workstation to get Dr. Calvino’s password. Fix the Transcribe that you get on the floor next to the bed to retrieve two audio recordings. Listen to both recording to get more samples of Danielle’s voice. The cabin is directly across the hall from Danielle’s cabin. Use the keycard that you got in the recreation center and enter the door. Collect the Neuromod and the FlexiFoam Bolts. Once you get the items, crawl under the desk to get the note that contains her password. Use the password in order to log in to the workstation. Under the Files tab, download the plan for Boltcaster ammo and a audio recording. Listen to the recording to get another sample of Danielle’s voice. Use the keycard that you got from Dr. Calvino’s workshop to enter the cabin. Access the workstation and download the four audio recordings. Listen to the third recording to get the keycode to the safe in the cabin. The safe is found behind the Looking Glass screen (turn off the Looking Glass). Break the screen with your wrench and retrieve the three Neuromods inside. Also, retrieve the EMP Charge on the desk next to the bed. Carry the turret and go into the habitation pods facility at the end of the corridor. Deploy the turret near the door watch out for a Poltergeist hiding in the area. Fire it with the Shotgun once you see it, then lead it towards the turret for it to take more damage. After defeating the Poltergeist, search the habitation pods for supplies. Also, search inside Anders Kline’s pod and you will find a keycode to the mail room which can be found next to the concierge. Search next inside Skye Braxton’s pod and you will find a TranScribe containing an audio recording of Danielle. Search the last row of pods to get supplies and items. Go back to the Crew Cabins B corridor then cross the foyer to enter the cafeteria. Do not bring the turret with you as there are several mind-controlled crew members inside the area. Before entering the cafeteria, search the bodies of Patricia Wang and Joseph McSorley near the entrance. Sneak into the cafeteria, then avoid being seen by the crew members. Activate your Psychoscope and locate the Telepath that controls the crew members. However, the cook (Will Mitchell) will speak to you over the loudspeaker and he will tell that you need to kill all the enemies in the area. After defeating the Telepath in the cafeteria, approach the kitchen window nearby to talk to Will. He will give you a keycard and will ask you to go to his cabin. His cabin is located in Crew Cabins A. Carry the turret again then enter the Crew Cabins A corridor. The cook’s cabin can be found at the end of the corridor. Deploy the turret at the entrance then look around the cabins for supplies. There is a large crate at the left side of the hall and it is blocking a duct that leads to Sarah Elazar’s locked cabin. Move the crate using the Leverage II ability then crawl through the small duct. Continue following the path of the duct until you reach Elazar’s cabin. Smash the glass beyond the tree to gain access to the cabin. Search for the Silenced Pistol and the Shotgun that is hanging in a cabinet next to the bed. Use Sarah’s workstation using the Hacking II ability to download a Weapon Upgrade Kit Fabrication License. Once you’re done searching her cabin, unlock the door and return to the hallway. 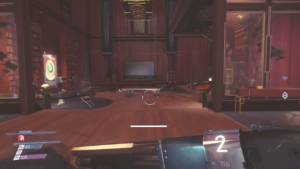 Open the safe in Jada Mark’s cabin (his cabin can be opened using the keycard you retrieved from Marietta Kyrkos) and get the Artemis Golden Pistol to complete this mission. Enter Hans Kelstrup’s cabin using the keycard that you retrieved from his dead body in Psychotronics. From this cabin you will find a Typhon Lure as well as some emails that serve as supplements to the story. His cabin is just directly across the restroom. Use the keycard the he provided to open the door of the cabin. Get the Transcribe on the desk to obtain a recording containing Danielle’s voice. Hack into his workstation and read the emails to get a keycode for the Executive Suites. This keycard will unlock the Grav Shaft to Morgan and Alex’s cabins. The award that Mitchell is talking about is on the table next to his bed. Take the award then return to the cafeteria. In the cafeteria, return to the kitchen window where you met Mitchell then hand over the award. He will now let you go inside the kitchen using the side entrance. Jump over the counter and enter the doorway to access the small room. Wait a few second before entering through the door. Inside the room, Mitchell will tell something about a broken water pressure regulator. Find the regulator next to Mitchell and repair it. After fixing the regulator, Will Mitchell will give you access to the freezer. Wait for Mitchell to unlock the door to obtain the keycode. Equip the Disruptor Gun and incapacitate Will Mitchell. Search Mitchell’s body to get two Neuromods and the keycard to the kitchen. Enter the freezer then open the first sliding door straight ahead. Look around the room to find clues on where the real Will Mitchell is. After looking around, open the sliding door next to the storage area and you will find several bodies lying around. Grab the Q-Beam ammo, Suit Chipset, and three Neuromods before exiting the room. Search the last storage room in the freezer and you will find the body of Abigail Foy. Search Foy’s body to get a Transcribe containing a recording from Danielle Sho. Exit the kitchen then cross the foyer towards the entrance to the fitness center. Enter the keycode that you retrieved from the security station at concierge. The fitness center is also filled by mind-controlled crew members controlled by one Telepath. Equip the Disruptor Gun and go inside while crouching. The corridor which lead to the pool is block by flames that are erupting from a ruptured gas line. Use the GLOO Cannon to seal the ruptures. A Telepath will appear near the pool, so use your Q-Beam to incapacitate this enemy. Once you defeat the Telepath, approach the window by the pool and bang it with the wrench. A cutscene will commence once you do this action. Return to the kitchen and kill “Will Mitchell” then go back to Danielle Sho again and talk to her.